We'll be installing the Team Foundation Server Extensions for Project Server in this section. In the previous recipe we prepared the information we needed to ensure a successful integration. Now we'll build off of that as we install and configure the integration. Please take a moment to review the checklist before we begin. Our first decision point is whether or not this will be a test or production instance. While installation process is the same in either case, the configuration has some variations to consider. 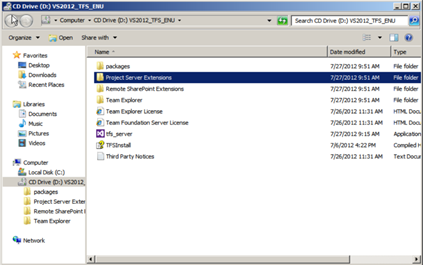 Insert the Team Foundation Server 2012 DVD / ISO in the drive, navigate to the Project Server Extensions folder, and launch the tfs_projectServerExtensions.exe to begin. In the license terms' dialog box, accept the license terms, and then select continue. When the next screen appears select Install Now. On the last screen, select Close. You are now done with the installation. Remove Visual Studio 2010 from the client machine. Locate the Visual Studio 2012 installation media and install Visual Studio 2012 on the client machine, following the instructions as prompted. As discussed in the previous recipe, there are a number of prerequisites and client software that need to be installed. On each machine that will be used by a project manager to synchronize data between enterprise project plans and team projects, you will need to install both Visual Studio 2012 and Microsoft Visual Studio Team Explorer. In reality, the only reason you need Visual Studio is the add-in list. However, as far as this book is concerned, the only way to get the Visual Studio 2012 add-in list is to install a copy of Visual Studio 2012. Although we have covered most of the key parts already, there are a few other things you might want to consider. We'll cover those in the following sections. Uninstall Team Foundation Server 2010 and any extensions. Don't worry, all the configuration data is stored in TFS's database which the Upgrade process will detect. 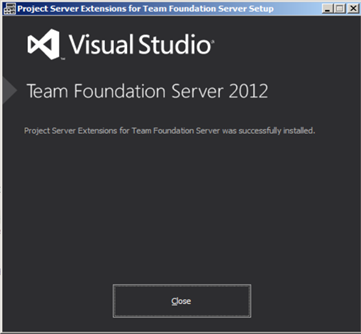 Install/upgrade to Team Foundation Sever 2012 as per the installation guide. 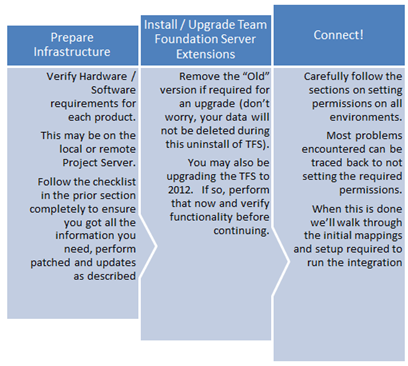 Install/upgrade the Team Foundation Server Extensions as described in the previous recipe. Visual Studio Team Foundation Server 2012 now requires a 64-bit machine, as do the Team Foundation Server Extensions for Project Server. Some good news for upgraders, you will not need to unregister any previously mapped components prior to upgrading. More good news, although you need to install Visual Studio 2012 to get the add-in list for Microsoft Project Professional, Microsoft tells us that we will not need a CAL to interface with the integration itself. It has been reported that the installation procedure for Team Foundation Server 2012 may switch the service account from a specified domain account to network service. If this occurs, you will need to switch it back to the account you noted in earlier sections while preparing for the installation. Alternatively you can reset the project server permissions based on this new account. This can be done using the TFS administration console. 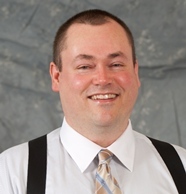 We will examine what's needed to ensure that your integration is successful. We'll cover the prerequisites and the planning needed to begin, scenarios for test or production environments, and different types of synchronization that are possible. Using Team Foundation Server Extensions for Project Server, project managers can make Project Server to access real time project status and resource availability of teams who work in Team Foundation Server. Following the successful configuration of the two server products, the synchronization engine maintains scheduling data and resource usage in the mapped Project Server enterprise project plan and Team Foundation Server team project. There are a few pieces of information we need to collect and a few configuration tasks we'll need to make sure have been completed properly. Sever names for each server involved: Project Server 2010 and Team Foundation Server 2012. Service account names and login information: You'll want this information handy throughout the tasks in this book. See the Active Directory – Highly recommended for production installations section at the end of this chapter. Visual Studio 2012 must be installed on the same machine that will be used to configure the integration of the two server products, and on any machine you will use to configure the integration. This does not need to be on one of the server machines. Project Server 2010 must be updated to SP1. This product's installation and initial configuration will need to be verified operationally (not covered in this book). Project Professional 2010, or Project Professional 2007 SP2 with the KB980209 hotfix (http://support.microsoft.com/kb/980209), or Project Professional 2007 with SP3 installed on your administration machine. The SharePoint web application for the instance of Project Web Access or PWA (Project Web App) must be set to Classic Mode Authentication. You will not be able to register it if the authentication is set to Claims Based Authentication. Visual Studio Team Foundation Server 2012 will need to be installed on each application-tier server that hosts Team Foundation Server and that will participate in synchronizing data with Project Server. This product's installation and initial configuration will need to be verified operationally (not covered in this book). 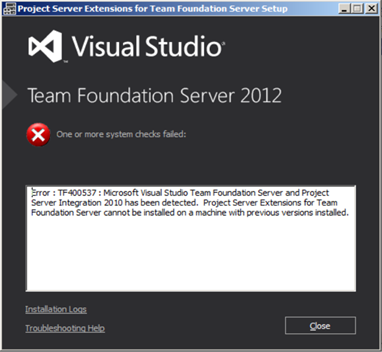 Team Foundation Server Extensions for Project Server will be needed later on during the installation. For now, just locate the Team Foundation Server 2012 DVD. Now that the common pre-configuration items are out of the way, we can move on with the planning. At the core of this integration are the work items in Team Foundation Server which synchronize with the Tasks in Microsoft Project plans in Project Server. Using this integration, project managers and software development teams can use whichever tools that work best for them, and share information transparently. The integration and all products involved in it are scalable from installations of a few users to several thousands. You can easily scale this integration out by using multiple Project Web Access servers mapped to a multi server, that is, TFS deployment. We'll cover the specifics of the integration in a later section, but this is a good spot for an overview diagram. We have a few final points to keep in mind, and some valuable tips to make your installations go smoothly. This will not be a complicated integration if we follow the given advice. You weren't planning a test environment? Now would also be a good time to plan a test system in your deployment schedule. It will not only help you to have an environment to test out configuration changes but will also be a good safety measure to ensure all your mapping is correct before you deploy to a production environment. Active Directory is technically not required, however it is highly recommended that you deploy Active Directory in your network. It will help with synchronization of the user accounts, groups, and services within Team Foundation Server and Project Server. Otherwise you'll be doing this manually between the two environments. If you haven't deployed Active Directory yet, but are planning to deploy it, now would be a good time to begin that. We mentioned this in the previous checklist, but it bears repeating here. The authentication that is assigned to the SharePoint web application for the instance of PWA must be set to Classic Mode Authentication. You will not be able to register the instance of PWA if the authentication is set to Claims Based Authentication. Portions of this excerpt were re-published by the author(me). The full book is available for purchase here http://www.amazon.com/dp/1849688540/?tag=packtpubli-20. Note that some content may be different (pictures, charts, etc) as I'm trying to format this post for the web. The publisher also wanted me to share this link http://bit.ly/ZulWBG but it really will just bring you to their site for an ebook only ordering page. I’ll post some excepts from the book here as well as some cool info the the MVP 2013 Global Summit. 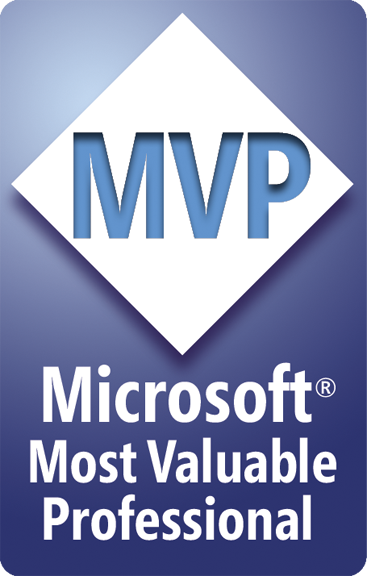 Just got back from the 2012 Microsoft MVP Global Summit in WA. While the Windows 8 Consumer Preview got most of the media attention, as an MVP in ALM my attention was on what Microsoft was doing with Team Foundation Server 11 and Visual Studio 11. Some of what we learned on future direction was covered under strict NDA, but we are allowed “released” info, which in this case is the VS 11 / TFS 11 beta. So as always, your mileage may vary a little since I’m basing this off the beta. There is a lot to be excited about for all the roles in an organization in the new releases. Developers and Testers will be especially pleased, but I wanted to cover some the new items that Project Managers and Product Owners will be particularly excited about. Though certainly a developer centric toolset, Microsoft is starting to realize that getting world class software products out the door requires more than just well equipped developers, and they want Visual Studio to be at the core of it. A quick note here on the Upgrade. I upgraded one of my combination TFS2010/VS2010 virtual machines right in the Summit (figured I could get some help that way if anything popped up ). My only surprise here was I needed to fully uninstall TFS before continuing. This is one of the reasons you always need to have a solid machine and DB backup before attempting this. I would have figured the upgrade wizard could have handled this, and a roll-back if it failed, but its just something to keep in mind. If you are working on a scaled out TFS installation, you will need to touch each server. I’d never recommend running out and upgrading a production TFS instance on a beta release but it is encouraging that Microsoft will be supporting that upgrade path right through to RTM release though. I’ll cover more details of the upgrade process in another post. One encouraging theme I picked up on while at Microsoft was an definite embracing of Agile and Scrum specifically. Anyone who has used TFS for any length of time knows you can configure it for almost any process, however who wants to spend the time doing this for each team you work with. If you are one of the many organizations jumping on the Agile/Scrum bandwagon (if you aren’t you should ask why) you’ll be very happy with this release. The Visual Studio team has put out upgraded Scrum, Agile, and CMMI Process Templates (final names not decided, but in beta its Microsoft Visual Studio Scrum 2.0 – Preview 3, for the new Scrum one and MSF for Agile Software Development 6.0 – Preview 3). If you are starting out with a new Team Project you’ll get to dive right into the new stuff, but as in the last release, if you are working with a 2010 project you’ll need to do some import / export work in the Process Template Editor. The good news is though you can continue with your existing template until you are ready. I’ll cover the template upgrade process in a later post. These sets of features should get you excited if you run software development projects. Sure we had some of these in TFS2010, but you had to work with a combination of Work Item configuration and some spreadsheets (Iteration Backlog, Product Planning) that were shipped originally with the old Agile template and had some serious bugs in them. Now all of this functionality is in the core product and fully accessible from the new Team Web Access web site and Visual Studio, with drag and drop support. What this means is if you are starting out a new Team and Team Project this wont take you hours of work like it used to. I’ll add some screen shots of these here shortly. If you were already using the Agile or Scrum template and customized your User Story work item you may have some adjustments to make with the new template. Same situation if you went wild with States. The new Template really only supports 3 of them, you’ll need to map to these. The Task Board is a brand new item. If anyone has looked at VersionOne’s task board, then this one will look real familiar. Basically it is an electronic Story Board or Kanban board for instant status on where your User Stories and supporting Tasks are at. Also new are the support of product teams. This allows the proper status of the Tasks as they may relate to multiple product teams. Again this is something we can configure right in Team Web Access. Another new tool on the horizon is the Storyboarding Power Point plug in. This item warrants its own post, but in summary it will allow an analyst (i.e. a non-programmer) to put together an animated collection of proposed product screens quickly to avoid the dreaded “that’s not what I wanted” statement. I’ll be adding to this post as I get more screen shots and the rest of my notes together from the MVP summit. Team Portals in TFS for Areas ? The Team Portals in TFS 2010 were a huge bonus for any PM or Scrum Master looking to point stakeholders and teams to one spot for critical project communication and documentation. The Team Portals are designed at a Team Project level. The problem you quickly run into with the Team Portals however if you further divide your Team Projects up by Areas for each solution. You could certainly customize the templates or use the API to develop a tool to do solution level portals but that may be more work than you really want to do. If your Team Project is already created, and you really need a portal for each area, the simplest solution would be to just manually create a portal using the sam design elements (very easy), copy the reports folder to a new one for just your area (to cusomize later) and create a team query to display the common lists by area and set the lists to use these. If you need to set the burndown (if you are using an Agile process template) to just use that area you'd need to also change the default filter on SSRS reports to reflect just the area you need. I will update this post in the future with some specific instructions for doing this. Back up your server. Take a thorough inventory of your TFS security settings and determine if you referenced any domain groups. You can set these to a local group for now and move them into a domain group later. Record the login credential settings of all TFS services and Application Pools. These may or may not be set to Domain group, if they are you will need to go back in after the Domain migration. Depending on how your tiers are set up this may involve checking a few servers as well. Shut down all TFS services and Application Pools and Web sites to avoid any user issues during your migration. You'll need to put the services on manual or disabled to avoid them trying to restart during the migration since a reboot will be needed to complete the domain migration. Execute your domain migration as planned. Change the identity of everything you noted with domain specific identity in step 1 to an identity in the new domain. Set all the services back to their original startup settings, and app pools & web sites back to their original states. Restart the server and check TFS access. You'll need to use with caution on a heavily loaded server since it runs against the transactional DB but an occasional run would be fine. I get this question a lot, usually from a “pilot” project that turns into more and needs to fall under enterprise configuration guidelines. On the application-tier server, open a Command Prompt window and change directories to the directory that contains the TFSConfig utility. By default, this utility is located in Drive:\Program Files\Microsoft Team Foundation Server 2010\Tools. /account:AccountName /password:NewPassword, and then press ENTER.